This is the first storytime of the summer season! To start it all off I chose the It's a Mystery theme because for the state of Texas' Summer Reading Program theme is "Get a Clue... At the Library". It was a lot of fun to do and the children loved it! The children helped me say what color the barn had been painted. The toddlers and their older siblings really liked doing this book because they had to guess what animal each nose belonged to. I do which that book showed more of each animal as a whole, be nonetheless it was a lot of fun to hear their guesses! The children mostly listened this one, but they did like the surprise ending when we all discover who Louella Mae and why she ran away. The children loved this book and had a lot of fun responding to each accusation. Some even said that they would want to share the cookies with the ants because ants have germs! Does a frog live in a tree? Does a frog live a nest? Does a frog live on a lily pad? Continue with other animals and where they live. Whose shadow I might be? I was inspired by Lisa and her blog post for I Spy Mystery/Guessing Game Storytime on her blog Storytime Source Page. I modified the words to the activity today because of how active the toddlers were. They were itching to go and put the animals on the board. 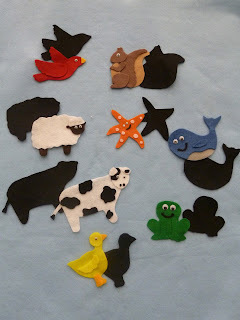 I made two animal per home: whale and start fish for the ocean (my favorite ones! ), bird and squirrel for a tree, duck and frog for the pond, and a cow and sheet for the barn. The toddlers had a lot of fun with this. 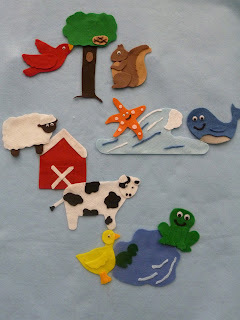 Katie over at Story Time Secrets posted this shadow guessing game activity. I morphed this to match the Where Do I Live? flannel board by just making black silhouettes of each animal. I placed the shadows on my flannel board and asked the preschool children what each shadow looked like. For the most part they got each one right. They loved it! Everyone loved it, as usual! To continue our activity of know where things live, the toddlers got to glue and color an activity sheet. I created the page by adding clip art of a house, pond, and a barn. Then created cut outs of a child, duck, and cow. The children had to glue the animals and child next to the place where they live. To help the children really get into the pretending to be detectives, we all made pretend magnifying glasses. Using a template I found via Mailbox, I cut out the body out of fun foam. For the "glass" I used leftover laminate (after I had laminated some posters). If you do have laminate, you can use cling film. The children got to glue the laminate circle to the back of magnify glass.